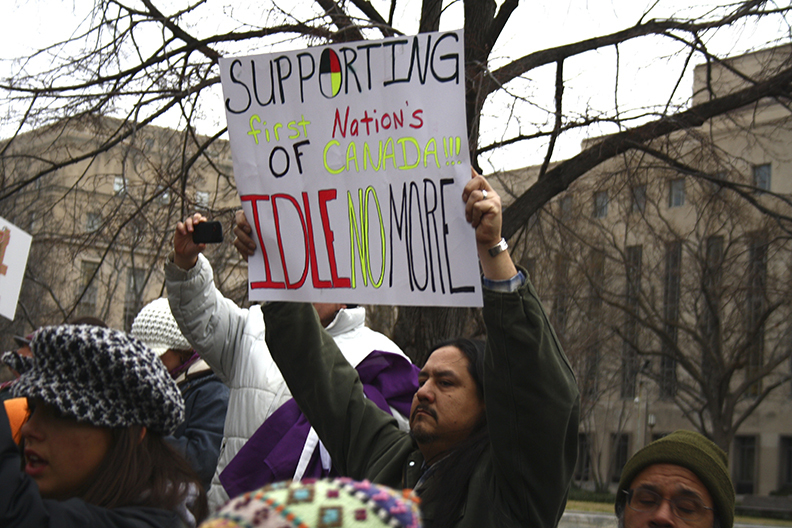 The Idle No More movement began drawing headlines in late 2012 as a protest against the Harper government’s omnibus budget bill C-45, which contained provisions that it saw as eroding indigenous rights. However, it quickly broadened to express a wider political discontent among Aboriginal Canadians. Actions included political protests in front of Parliament as well as more unconventional direct acts such as blocking roads and railways. Beyond expressing specific grievances, these actions manifested a sense of marginalization, a lack of political voice in mainstream political institutions. One way of addressing this marginalization would be to increase Aboriginals’ representation in Parliament by creating more Aboriginal-majority ridings. Each member of Parliament is elected from a geographically defined constituency, and accountable to its residents. But the system can create significant barriers for representation of national or ethnic minorities. 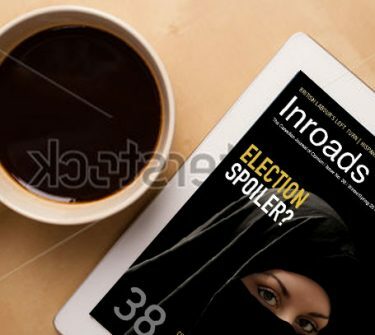 A minority group can expect to elect a candidate of choice only if it forms the largest group in a riding; otherwise the majority group will regularly prevail, which under certain circumstances could result in total exclusion of minorities. 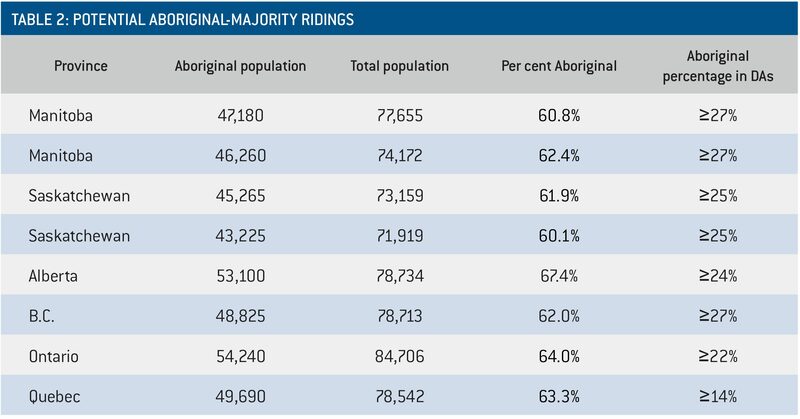 Table 1 compares the proportion of Aboriginals in the population with the number of Aboriginal-majority ridings in selected provinces. Under the 2011 federal election boundaries, only four of Canada’s 308 ridings had Aboriginal majorities: Western Arctic, covering the Northwest Territories (50 per cent); Desnethé–Missinippi–Churchill River in northern Saskatchewan (66 per cent); Churchill in northern Manitoba (70 per cent); and Nunavut (85 per cent).1 Thus while Aboriginals constitute about 4 per cent of Canada’s population, they hold majorities in barely 1 per cent of its ridings. Such limited political voice can hardly be reassuring for a segment of the population that has inherited serious social disadvantages. The numbers bear out our expectations. Aboriginals have historically been severely underrepresented in Canadian federal politics: of the 10,384 total constituency elections held from Confederation up to 2008, only 27 were won by Aboriginals.2 Some of this underrepresentation came from Aboriginals’ refusal to participate politically in what was viewed as a foreign state. This tendency was exacerbated by settlement patterns which, under our system, have presented a formidable barrier to elections resulting in Aboriginals having meaningful parliamentary representation. Surely, this systematic underrepresentation has found its way into the frustration animating the Idle No More movement. Parliamentary constituencies are not fixed, however. Indeed, Canada is just now completing its decennial revision of riding boundaries to reflect population growth and changes, and the Fair Representation Act of 2011 added 30 seats to Parliament. The redistribution process offers an opportunity to go beyond representation by population and address the dimension of group representation, in particular that of Canada’s Aboriginals. In other countries the “proper” representation of minority groups has been at the crux of significant political debate. Yet in Canada this topic has been largely absent from policy discussions for more than two decades. This was not always the case. Earlier, there were efforts to address the underrepresentation of Aboriginals at both the federal and provincial levels, including one authored by Louis Riel.3 In the most recent systematic proposal, the 1991 Royal Commission on Electoral Reform and Party Financing recommended the creation of Aboriginal-plurality constituencies. Plans to reserve seats for Aboriginal representatives were proposed at the provincial level in Nova Scotia, New Brunswick and Quebec. None of these proposals were accepted or implemented. We believe that the time has come to revive the discussion. Though we cannot lay the problems faced by Aboriginals solely at the feet of ineffective representation, clearly better representation is part of any strategy to improve the situation. What methods are available for doing so? The current electoral system is at the root of Aboriginal underrepresentation. Aboriginals tend to be scattered over large geographical areas or live among non-Aboriginals. It is therefore difficult to create single-member districts with Aboriginal majorities or pluralities. Several alternatives could address such underrepresentation. The first option involves replacing the first-past-the-post system with some form of proportional representation (PR). Under proportional representation (or “party list” systems), electors cast votes for parties rather than candidates, and seats are allocated to parties according to the proportion of support they receive. National minorities can benefit from PR by forming their own political parties and electing candidates from their lists even if their support is spread over a wide region. In addition, parties may be required to include minimum numbers of minority members (or women) on their lists. An alternative to list PR is multimember districts, which allow candidates with less than a plurality of support to be elected. Several methods can be used to elect candidates to such districts, including the single transferable vote (STV). Under STV systems, voters rank candidates in order of preference, and the counting system then allocates these preferences to select the candidates who are most preferred by the greatest number of electors. This makes it easier for minorities to elect a candidate of their choice. Both proportional representation and STV have been proposed at the provincial level in the last ten years. Referendums to introduce proportional voting failed by large margins in Ontario in 2007 and Prince Edward Island in 2005, and STV failed narrowly in British Columbia in 2005 and by a more substantial margin in 2009. Thus it seems that Canadian voters prefer to keep the plurality system with geographically defined single-member constituencies. Even so, two reforms could increase minority representation under that system. New Zealand’s effort to guarantee representation to its Mäori population is perhaps the most widely discussed example. It has existed in one form or another for 140 years and has been maintained even as the country has changed from a pure plurality to a mixed system. Recently, it was extended to the local level.5 At the national level, New Zealand is geographically divided into two sets of overlapping constituencies: Sixty-two are “general” seats, similar to Canada’s, and seven are reserved Mäori seats, elected from separate voter rolls. Those who identify themselves as Mäori may choose to vote in either roll. This guarantees that Mäori communities select at least seven representatives. This technique is not “foreign” to Canada. For example, Quebec maintains French and English school boards with overlapping constituencies (school districts), elected by separate voter rolls. The default eligibility is for the French school board, but electors, with some restrictions, may choose to vote for either. As in New Zealand, membership in the “alternative” list (Mäori or anglophone) is voluntary. Provinces could introduce a system similar to New Zealand’s by reserving one or more seats for Aboriginal constituencies. Ontario, for example, could be further divided into two Aboriginal ridings (the number of seats reflecting the Aboriginal population share), elected from separate voter rolls. Indeed, it’s even possible to imagine Aboriginal ridings that cross provincial boundaries, for example in Atlantic Canada. This technique removes many geographical constraints on minority representation. However, the differentiation of electors by ethnicity makes many uneasy, and it would raise difficult legal questions, including eligibility for the Aboriginal voter rolls. Retaining a single voter roll but modifying districting standards is probably a more palatable alternative. Another possibility would be for Canada to introduce even greater flexibility than it now has in population disparities among ridings. Population sizes among ridings – both within and among provinces – are already significant. Federal ridings vary between 27,000 (Labrador) and 124,000 residents (West Vancouver–Sunshine Coast–Sea to Sky Country). The allocation of seats among provinces also means that the average population of a riding in Prince Edward Island is only 34,000, while the average in Ontario is more than 114,000. It would be easier to create one or more ridings with Aboriginal pluralities if those ridings had smaller populations. Manitoba and Saskatchewan (each with an Aboriginal population of around 15 per cent) already use a de facto “small riding” strategy; each of those provinces has an Aboriginal-majority riding with between 65,000 and 75,000 residents. Up to a point, Canadians tolerate such inequalities to protect the interests of smaller provinces and rural and northern residents. We suggest that there is a better and more straightforward option, one that does not require ethnically separate voter rolls or large population disparities. Creating noncontiguous ridings would facilitate the concentration of Aboriginal voters into constituencies where they would form pluralities or majorities. Ridings are currently defined by contiguous geographical territories, and are drawn within provinces according to the various criteria specified in the Electoral Boundaries Readjustment Act (EBRA). Ridings within a province must be reasonably similar in population (typically no more than 25 per cent deviation from the electoral quota) and of reasonable geographic size, and they may recognize communities of interest or identity or the historic pattern of districts. Although the EBRA does not state so explicitly, by tradition ridings are geographically contiguous: it is possible to walk from any point in a riding to any other without crossing its boundary.6 However, the rationale for contiguity is actually quite weak. Some defenders of contiguity argue that it limits gerrymandering. Yet the “imaginative” boundaries of many electoral districts in the United States demonstrate that contiguity – like an equal population requirement – is no barrier to gerrymandering. On the other hand, the use of contiguous ridings is an obstacle to the fair representation of minorities. Alberta, British Columbia, Ontario and Quebec are each home to more than 100,000 Aboriginals, yet none have a single riding in which Aboriginals form a plurality. Noncontiguous constituencies formed by small geographic units, such as the Census Dissemination Areas (DAs), would solve this problem.7 Dropping the contiguity requirement would allow districts to be established out of physically disconnected units. Creating ridings that consist of more than one geographically distinct area with concentrated ethnic or national minorities could produce several Aboriginal-majority or Aboriginal-plurality districts. Noncontiguous ridings are currently used in Ukraine and in the Wisconsin state legislature, and a noncontiguous Aboriginal-majority riding was proposed in 2001 by a boundary commissioner in New Brunswick. Moreover, noncontiguous ridings fit squarely within the spirit of the EBRA, which calls for the representation of communities of interest. This cannot be done at present when such communities are separated geographically. Noncontiguous ridings can create a proportional level of representation for Aboriginals. Manitoba, for example, currently has one Aboriginal-majority riding, whereas their proportion in the population calls for two. As shown in table 2, we have used the 2006 Census DAs to identify two potential Aboriginal-majority ridings. The populations of the two ridings conform to the criteria for existing ones. 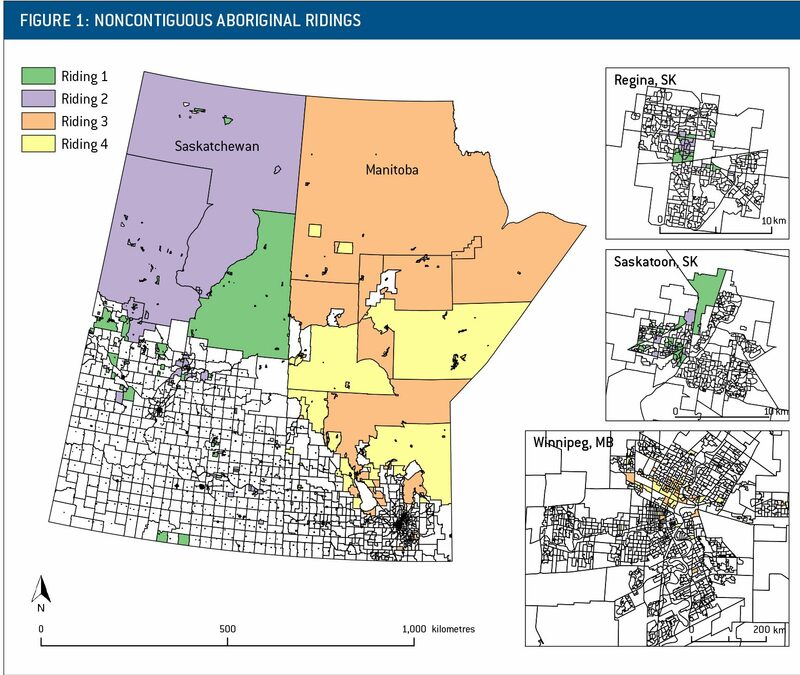 In much the same manner as in Manitoba, a proportional number of Aboriginal-majority districts (two) can be created in Saskatchewan with populations similar to existing ridings (see figure 1). For those two provinces, at least, bringing Aboriginal representation up to proportionality would require only noncontiguous ridings, but not significant departures from population equality. The situation is slightly different in Alberta, British Columbia, Ontario and Quebec. Based on the populations, the first three should have two Aboriginal-majority ridings, while Quebec should have one. In all four, however, given the locations of the population, it is only possible to create one majority district while remaining within the standard population deviation (±25 per cent) in each province. Using a “small riding” strategy in conjunction with noncontiguous districts would permit additional majority constituencies. To take an extreme hypothetical case, dropping the population threshold to 27,000 (the population of the riding of Labrador), for example, would make it possible to create as many as seven Aboriginal-majority ridings in Manitoba. Noncontiguous districts not only create majorities but also place more Aboriginal electors in majority ridings. In Manitoba, for example, about 29 per cent of the province’s Aboriginals live in the current majority riding (Churchill), but more than 50 per cent would reside in one of our two hypothetical ridings. The effect is even more pronounced in Saskatchewan, where noncontiguous ridings would nearly double the number of Aboriginals living in majority districts (from 31 to almost 62 per cent). Consequently, such an arrangement extends majority representation to a much larger group. Even taken as first approximations, our proposed ridings come much closer than the existing boundaries to creating fair representation for Aboriginals in Canada. Of course, the precise riding boundaries we set out here are not necessarily practical or desirable. As shown in figure 1, ignoring geographical proximity entirely means that areas next to each other, particularly in cities, may be in different ridings. Some geographical grouping, such as creating distinct urban and rural districts, might be desirable (one might decide, for example, to place all the Aboriginal DAs in Winnipeg in the same riding). Any such additional constrains, however, may limit the potential number of majority districts. We set out a specific set of boundaries here simply to demonstrate what noncontiguity makes possible for minority representation. Moreover, contiguous and noncontiguous ridings should not be seen as mutually exclusive. Manitoba, for example, could create one contiguous and one noncontiguous Aboriginal-majority riding and still arrive at proportionality. Creating noncontiguous ridings could help Aboriginals become fuller participants in federal politics and could address the political tensions created by perceptions of exclusion and marginalization. The Idle No More movement has reminded Canada that ignoring Aboriginals in major political decisions will provoke dramatic confrontations. We believe that the redistribution of parliamentary seats offers an opportunity to provide a greater voice for Aboriginals, a potentially important step in improving Canada’s relationship with its Aboriginal citizens. Although we have shown the potential benefits of noncontiguity for Aboriginals, there is no reason that the discussion on improving minority representation be confined to this group. Our approach, for example, could also be applied to official-language minorities. Simply removing the straitjacket of contiguity opens the way to a range of creative possibilities for improving Canada’s system of parliamentary representation. 1 These figures are based on the 2006 Census and the ridings used for the 2011 federal election. 2 Peter Niemczak and Célia Jutras, Aboriginal Political Representation: A Review of Several Jurisdictions, BP-359E (Ottawa: Parliament of Canada, 2008). Retrieved here. 3 David C. Hawkes and Bradford W. Morse, “Alternative Methods for Aboriginal Participation in the Processes of Constitutional Reform,” in Options for a N ew Canada, edited by Ronald L. Watts and Douglas M. Brown (Toronto: University of Toronto Press, 1991), pp. 163–90. 4 Andrew Reynolds, “Reserved Seats in National Legislatures: A Research Note,” Legislative Studies Quarterly, Vol. 30, No. 2 (2005), pp. 301–10. 5 In New Zealand’s Mixed-Member Proportional system (MMP) electors cast a vote for a candidate within a geographical constituency, and a vote for a party. Representatives are elected by plurality within a constituency and from the party list, the latter allocated so as to render the total party representation proportional to its list vote. See Janine Hayward, “Mandatory Maori Wards in Local Government: Active Crown Protection of Maori Treaty Rights,” Political Science, Vol. 63, No. 2 (2011), pp. 186–204. 6 Gerald R. Webster, “Reflections on Current Criteria to Evaluate Redistricting Plans,” Political Geography, Vol. 32 (2013), pp. 3–14. 7 The units that allow us to carry out such an analysis are Census Dissemination Areas (DAs). A DA is the smallest geographic unit used to report Census data of which the aggregate, in recent censuses, covers the entire territory of Canada. For the 2006 Census, there were nearly 53,000 DAs, with an average population of just under 600. Benjamin Forest is an Associate Professor in the Department of Geography at McGill University in Montreal. Both are members of the Centre for the Study of Democratic Citizenship.